STEP 1: Pre heat your oven to gas mark 5 or 180C and grease 2 baking trays. STEP 2: Sift together the flour, salt, bicarbonate of soda, ground ginger & cinnamon. STEP 3: Heat the butter, sugar and syrup until dissolved then leave to cool. Once the mixture has cooled mix with the dry ingredients to make a dough. STEP 4: Chill the dough in the fridge for around 30 minutes. STEP 5: Roll out the dough to around 1/4 inch thick and cut your christmas tree shapes then place on the trays allowing space for them to spread. STEP 6: Place in the oven for 10 – 15 minutes then allow to cool completely. STEP 7: Mix together your icing sugar and water until the mixture is thick. Add more icing sugar or water where needed to get the correct consistency! You’ll want the mixture to be able to coat the back of your spoon. STEP 8: You now have two options, you can either add a little bit of food colouring (half a teaspoon) to the mix, ice the top part of your cookies then add a little bit more food colouring to the mix and ice the next part of your cookies, OR you can now dish your icing sugar into three separate bowls and mix each of them to the colours that you like. STEP 9: Start by icing the top of all of your trees, leave to set for around 5 minutes then move on the next colour. 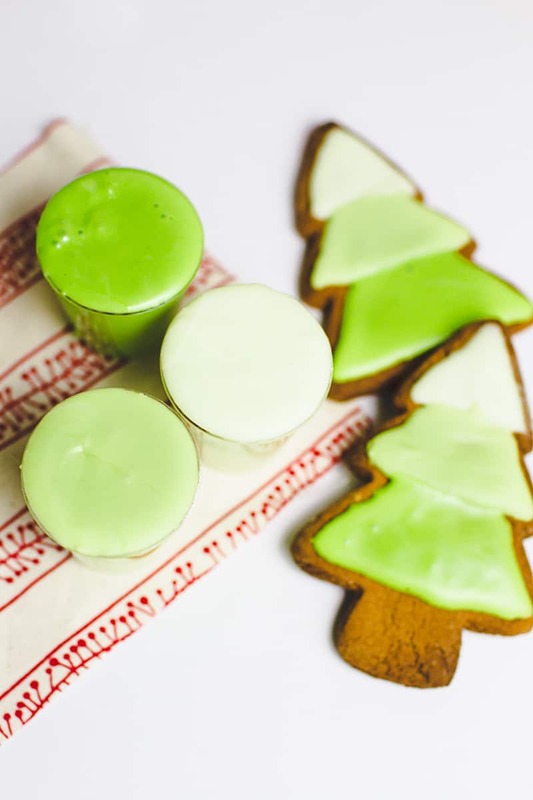 Do this until your tree is covered and you’ve left a little biscuit showing for the stump!